This makes the game look way more exciting than it actually is. The Forgotten Sands is a lesson in being underwhelmed. I wanted to love it, I really truly did. I loved The Sands of Time, The Two Thrones, and the re-imagined "Prince of Persia" but I just couldn't make myself enjoy Prince of Persia: The Forgotten Sands. 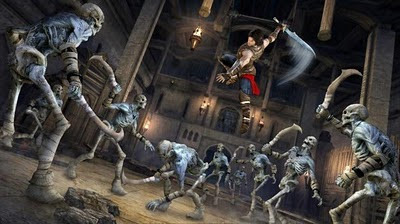 It's all been done before by other games in the Prince of Persia series. The Forgotten Sands has the same old platforming without any new or interesting mechanics. I got the same feeling I did when comparing Bayonetta to the Devil May Cry series. It's the same gameplay mechanics with a new coat of paint. The combat feels extremely out of place. It amounts to a generic hack and slash. Most of the time the combat flow goes like this: hold x for 2 seconds, release, hold x for 2 seconds, release. It got in the way of the platforming and probably should have been left out altogether. The platforming isn't anything new. At least the last two entries in the Prince of Persia franchise tried new gameplay elements. The Two Thrones had me switching between the good prince and the evil one. The Prince of Persia reboot had me taking care of a partner while collecting magic that gave me more platforming abilities. The Forgotten Sands doesn't ask me to do anything new. Something else felt off but it took me a while to put my finger on it. This game lacks color. The color palette primarily contains browns and grays. Everything is desaturated. Nothing feels vibrant, invigorating, or alive. I loved the way color was used in the Prince of Persia reboot but I found none of that in The Forgotten Sands. Innovation trumps graphics and The Forgotten Sands is severely missing in the innovation department.